Ha! I didn't actually read anything in November. I did however explore my local bookstores. I have two and they are fabulous. So fabulous I spent almost as much as my grocery bill in November at them. 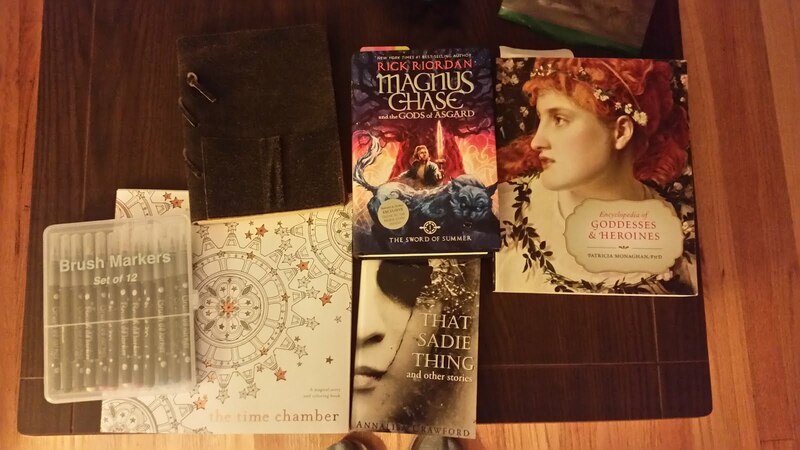 Here's what I kept, as opposed to wrapped as gifts. Well, I actually won That Sadie Thing from a giveaway on Annalisa's blog, but I bought everything else. An adult coloring book and pretty brush markers. A leather journal to write all my good reviews in, most of which at this point are for the fanfiction I've written but they still make me smile when I go over them. Goddesses & Heroines, because I have this crazy idea for a myth version of TVTropes that I really need to start up again ( International Myths). The Sword of Summer, #1 for Magnus Chase because, Rick Riordan, duh. Plus goodies at the cafe. The Barnes &Nobel here has Cheesecake Factory slices and they're half the price of the restaurant across the mall. Plus, my membership card gets me 10% off. I'm fourteen books behind my Goodreads challenge, don't think I'm gonna have 50 books read under my belt this year, but hopefully I can finish two or three this month. And then I'll have to think about books for next year's goal. Goodread's choice awards have been given out to now, and there's items there I'm itching to get my hands on. Ah, the life of a reader. Any of you buy something good this past month? A Black Friday deal perhaps?